Adding time is an important part of Time Tracking in Targetprocess. This information allows you to build burn down charts, progress summaries and other progress and tracking reports. To allow users to submit Time entries in a Project, its Administrator must enable Time Tracking in the settings of its Process. More information: Enable Time Tracking practice, How to enable and customize Add Time forms. You can use the software to customize cards on your Board View and add Time spent / Time remaining units to the card layout. You can also customize List Views. Simply add the Time column into the List within the Customize Cards tab. Time spent totals provide a summary of Time records across all dates and roles for a given entity. Time remaining totals provide a summary of the most recent records across all roles. or example, the latest Time remaining estimation made by the Developer plus the one made by the QA engineer. Time spent and remaining totals are available for User Story, Bug, Feature, Epic, Request and Test Plan Run entities. Time spent and remaining fields for a User Story summarizes time records across all child Tasks. It does not include Bugs inside the Story. Time spent and remaining fields for a Feature summarizes time records across all child User Stories and Tasks. It does not include Bugs inside the Feature. The same is valid for an Epic as well. Additional fields that summarize Time spent across Iteration / Sprint, Release, Team Iteration and Project can be added as Calculated Custom Fields. Time spent for a Feature's Bugs can be also summarized this way. User Stories, Tasks, Bugs, Requests and Test Plan Runs have a Time tab showing a detailed list of the posted Times. Use Time spent tracker to add Time records, modify spent/remaining time and delete time records. 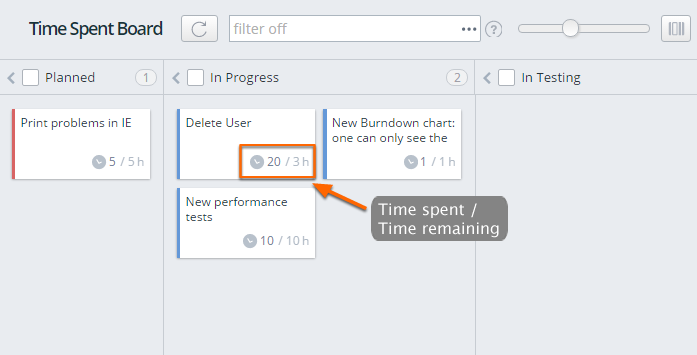 The Time tab for a User Story displays Times posted for its Tasks as well. The Time tab is not available for a Feature, Iteration / Sprint, Release, Epic, Project and Program. To get a detailed list of Times spent, build dedicated reports and merge them manually. To perform this action, first extract full lists of User Stories, Bugs and Tasks related to the Feature. Then, you can obtain the Times list for each entity. For a Project, create and export Custom Report by Time spent records within a given period. Targetprocess provides an enterprise-level, easy-to-use tool that allows you to track time spent on projects and optimize workflows on the fly. Gain full visibility into your team’s performance and customize time-tracking parameters to create a customized tool, completely unique to your business.